This dainty daisy like flower is a go-to for all types of headaches. Best used as a preventive medicine, feverfew is safe to use long term for most people. According to Rosemary Gladstar’s book Herbal Recipes for Vibrant Health, the active ingredient parthenolide controls chemicals in the body responsible for allergic reactions and inhibits the production prostaglandins that are implicated in inflammation, swelling and PMS. Having a similar affect to apsirin with a stronger but slower effect, feverfew is great for alleviating migraines, common headaches, inflammation and stress related tension. The active ingredient is destroyed if exposed to high heat, so eating the fresh or low-heat dried leaf is helpful. You can also make a tincture of the fresh plant. Eat the fresh or low-heat dried leaf as a tonic for headache and migraine relief. 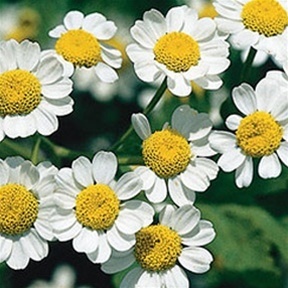 You can grow an indoor feverfew plant year round and nibble on a few leaves daily. Tincture of the fresh plant is also used while tea is not as effective as the active ingredient is destroyed if exposed to high heat. Cautions/Contraindications: Feverfew can promote menstruation or stimulate the menstrual cycle and therefore isn’t recommended for pregnant women or those taking anticoagulant drugs.